Are automated vehicles automatically low carbon? Home > EV > Are automated vehicles automatically low carbon? The combination of connectivity, automation, plus shared vehicle ownership and use has the potential to make car travel greener and cheaper, cutting energy use and helping accelerate the introduction of low carbon vehicles. However, these energy and carbon benefits are by no means guaranteed and will require strategic policy interventions to maximise them according to new work by the Institute for Transport Studies (ITS) at the University of Leeds, commissioned by the Low Carbon Vehicle Partnership (LowCVP) and the Institution of Mechanical Engineers (IMechE). According to the study, better coordination and connectivity between vehicles and infrastructure is likely to improve energy efficiency, as well as potentially make road transport safer and quicker. The study ‘Automated vehicles; Automatically low carbon?’ (which can be downloaded below) was presented at the Low Carbon Vehicle Partnership Conference, held at the Olympic Park in London in July. Over 170 delegates at the Conference ‘A Low Carbon Transport Future: The UK capability to lead the way’ heard responses from key stakeholders to the implications of the technology shift, and how connected and autonomous vehicles hold out the prospect of a revolution in the ways we will move around in future. The net impact of the technical developments will ultimately depend on how their introduction spurs further innovation in vehicle and transport system design combined with mobility service provision. The majority of system-wide energy efficiency benefits are likely to result from high levels of connectivity and coordination between vehicles and infrastructure, not through automation per-se. At full automation (i.e. driverless vehicles), the impacts are highly dependent on the degree to which the current paradigm of individual private car ownership transitions to new models of shared access and use. Automation and connectivity together can result in some vehicle level energy efficiency benefits. Full automation could help accelerate the transition to low carbon vehicles by reducing the practical difficulties often anticipated with these vehicles such as refuelling/recharging. Most of the large scale benefits of fully automated vehicles can only materialise when they are widespread and affordable which is likely to take several decades. Despite the challenges, and the potential political upheaval as a result of Brexit, Ian Constance of the Advanced Propulsion Centre claimed that the UK is well placed within the global EV marketplace, as he explained at the Low Carbon Vehicle Partnership Conference: “The great thing about the UK automotive industry is that we’ve got a lot of skills, capability, energy, drive and support from the government. Our automotive industry has done very well in the last few years - achieving record growth levels, creating thousands of jobs, and major inward investment. Our productivity in the automotive sector in the UK is one of the very best in the world, bucking the trend versus other sectors around the UK. 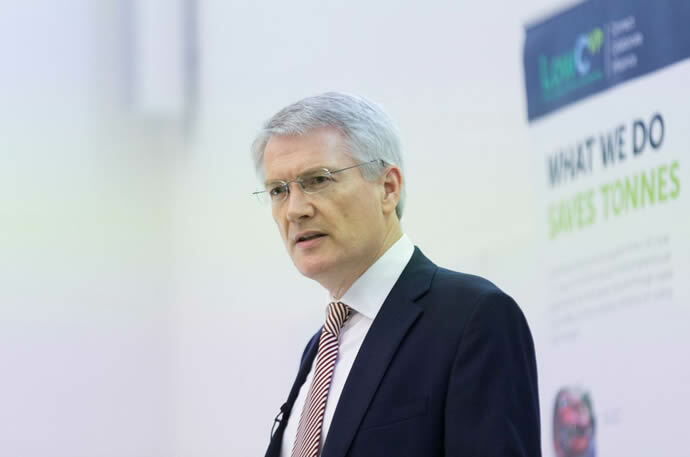 In his keynote address, Andrew Jones MP (pictured above), Parliamentary Under Secretary of State at Department for Transport, also championed the UK’s role in the low carbon automotive industry. “The best measure of how far this industry has come is that it’s now just about impossible to walk down any street in the country without passing at least one ultra-low emission vehicle. “Vehicles that were once exotic are now common place. A total of 28,000 low emission vehicles were sold in the UK last year and that’s more than in all the previous four years added together and I have no doubt that we’ll beat that total again this year. The progress we have made in this country has placed us as the fifth largest market in the world. But we’re not just buying low emission vehicles, we’re also building them. The performance of the UK motor industry as a whole has been outstanding in recent years and the UK is home to some of the most innovative and productive manufacturers in the world. “The low carbon component of the industry is also doing brilliantly. The Nissan Leaf is the world’s most popular electric car, and it’s made in Sunderland, and in 2014 that one plant made more cars than the whole of Italy. So far it’s produced 50,000 Nissan Leafs that have since driven over 1.1 billion emission free miles, and counting. The UK low emission vehicle industry is a huge success story and a source of strength for our economy. “It’s been a great few years for ultra-emission vehicles and, whatever the political ups and downs, I have no doubt that this industry will go from strength to strength. So we have to keep working together, innovating, improving our air quality, cutting carbon and the industry has the full support of the government in achieving those objectives.